Make Your own swing tags custom printed for clothing, knitwear, and garments. Full-colour custom swing tickets no minimum order for independent product makers and designers. In packs of 20, includes a choice of hanging options: metal ball chain, red ribbon or no hanging option. Each tag can be individually designed, or printed with the same graphic. Design online, upload logo, add text, sent fast. Full colour front and back, with your logos, images words text, even your own bar-code if you want. Because we make as few as one pack of 20, there is hardly any risk or set up cost in you making your swing tickets for your project, especially if you need them fast or are prototyping something for a show or event. No risk, and all upside in terms of presentation and planning, means good for your brand and good for business. 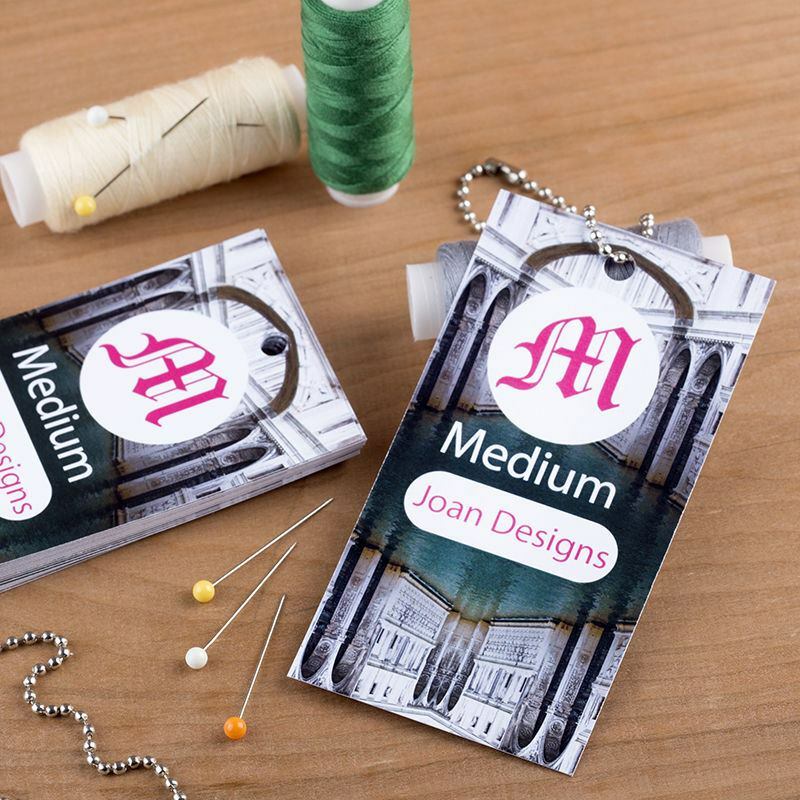 We support all sorts of designers and makers in setting up, so we know what you are looking for with your swing tags for garments, clothing, knitting or other handmade products. Each tag supplied with a 150mm length of silver-nickel ball chain, a red ribbon or no hanging option. We make and send fast. I am so happy with my tags, they are amazing quality, I have been searching for a company for so long to have some swing tags made, I have struggled to find one that didn’t cost the earth but still looked good. This company are a great price and amazing quality, very quick turn around also, I’m so pleased. Highly recommend I will definitely be using them again. Thank you so much. I was really sceptical of ordering because I have to admit, I haven’t heard of your company before but I couldn’t be happier with my garment tags! My logo has printed out beautifully and delivery was so unexpectedly fast! I will definitely be re-ordering when I need more tags. Love the super fast turn around and the products are very high quality. Great service! We offer both quantity, wholesale and a student discount on custom swing tags. For more details about the discount, please get in touch with our Customer Service team. We use a lovely strong calendared 300 gsm card that's coated both sides, producing in a bright, vibrant quality print all over. We recommend using lighter colours, a pattern, or an image as the background of your swing tag. Block, darker colours can make the cut lines appear slightly more prominent. If you have limited edition prices, sizes or special offers and you need a couple of tags to be different, you can design each tag individually so they can be printed with unique graphics. We help lots of new designers with their products and collections. People starting out who need top quality and small runs of swing tags, fabrics and even labels. One of our popular products for people and make fabric labels for handmade items.